Snug Hollow Farm is an organic farm bed & breakfast nestled in the beautiful Red Lick Valley of Estill County in Central Kentucky, just 20 country miles east of Berea. Snug Hollow boasts 300 acres of babbling creeks, glorious wildflowers, abundant wildlife, wooded mountainsides and the simplicity of country life, both past and present. The area is Appalachia at its best, and a stay at Snug Hollow Farm is an authentic experience in "holler hospitality." Innkeeper Barbara Napier was born and raised in Kentucky. A personable cross between Alice Waters and Tasha Tudor, Barbara maintains her strong ties to her life in the mountains and fulfills her lifelong dream of sharing her heritage by inviting guests to stay at Snug Hollow Farm. Her organic gardens are an inspiration to many and her vegetarian cooking is a gourmet gift to those fortunate enough to be guests at her table. Her mouth-watering meals are served at a long dining room table adorned with candles and fresh-cut flowers. 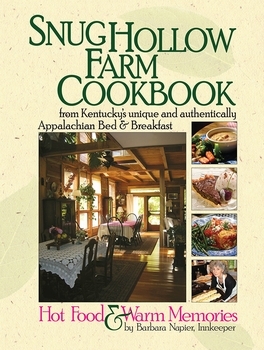 Beautifully illustrated with gorgeous color photographs of Snug Hollow Farm's flora and fauna as well as Barbara's bounteous kitchen, Snug Hollow Farm Cookbook: Hot Food and Warm Memories is a 128-page treasure that includes Barbara's inspiring insights, as well as her best-loved recipes. "Stuffed green peppers, pot pies, bean soup, mashed potatoes, macaroni and cheese or even a good cheesy pizza are my favorites," she writes. "I stick to my Kentucky roots, where we grow it, cook it, eat it or can it."